AU - Kim, Yang Min. AU - Sung, Jwa Kyung. AU - Lee, Ye Jin. AU - Lee, Deog Bae. AU - Yoo, Chul Hyun. AU - Lee, Seul Bi. AB - 최근 10년 동안 LED등의 인공광원을 사용하여 작물을 재배한 많은 연구들이 수행되었다. 인공광원 중 LED를 조사한 연구가 가장 많았고, 이는 LED의 에너지 효율성 및 광합성에 필요한 특정파장 비율을 디자인하여 조사할 수 있는 장점 때문이라 여겨진다. 광질이 작물 기능성 물질 생산에 큰 영향을 미쳤는데, 밀폐시설과 시설재배에서의 영향에 차이가 있었다. 밀폐시설에서 재배할 때 인공광의 광질에 따라 증가되는 기능성물질차이 외에도, 동일 광질을 사용하더라도 작물별로 증가되는 기능성물질이 달랐다. 자연광을 주광원으로 이용하고 인공광을 보광으로 사용한 연구에서, 밀폐시설에서의 연구와 동일한 광질을 보광으로 사용하더라도 기능성물질 생산 측면에서는 다른 결과를 보였다. 따라서, 밀폐시스템과 시설재배에 대한 보광연구 양쪽 모두 필요하다고 판단된다. 또한 광질에 의한 기능성물질 함량의 증가와 별도로 작물의 생산성이 고려된 기능성물질의 총생산량의 관점에서도 평가될 필요가 있다. 작물별, 광질별, 재배환경에 따라 작물의 기능성 물질이 차별적으로 증가할 수 있으므로, 기능성 물질 증진을 위한 작물 재배를 위해서는 환경제어-기능성물질-생산성이 종합적으로 평가되어야 할 것이다.BACKGROUND:Many studies on artificial lighting have been recently performed to investigate its effect on agricultural products with good quality. 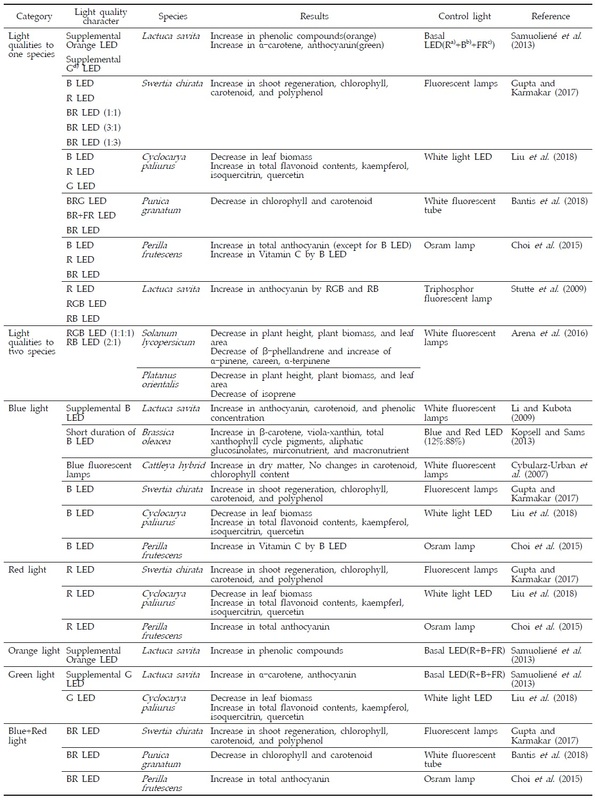 This review was aimed at comparing the effects of artificial light on functional metabolites of the plants that were grown in greenhouses and growth chamber.METHODS AND RESULTS:It has been summarized that artificial lighting both in growth chambers and greenhouses caused different functional metabolites patterns depending on light quality. Even though the same light quality was applied, different patterns in metabolites were observed in different plant species. For the same species, supplementation of the same light quality in both growth chambers and greenhouses did cause different functional metabolites patterns.CONCLUSION:Artificial lighting caused different patterns in functional metabolites of plants grown in greenhouses and growth chambers, depending on the light quality and/or plant species. The manipulation of plant growth and functional metabolites would be possible by engineering the light qualities, but knowledge on proper lighting condition depending on plant species and growth places would be necessary. Kim, Y. M., Sung, J. K., Lee, Y. J., Lee, D. B., Yoo, C. H., & Lee, S. B. (2019). Varying Effects of Artificial Light on Plant Functional Metabolites. Korean Journal of Environmental Agriculture, 38(1), 61-67. Kim, Yang Min et al. “Varying Effects of Artificial Light on Plant Functional Metabolites.” Korean Journal of Environmental Agriculture 38.1 (2019): 61-67. 1. Kim YM, Sung JK, Lee YJ, Lee DB, Yoo CH, Lee SB. Varying Effects of Artificial Light on Plant Functional Metabolites. Korean Journal of Environmental Agriculture [Internet]. 2019;38(1): 61-67. Available from: doi:10.5338/KJEA.2019.38.1.7. Kim, Yang Min, Jwa Kyung Sung, Ye Jin Lee, Deog Bae Lee, Chul Hyun Yoo and Seul Bi Lee. “Varying Effects of Artificial Light on Plant Functional Metabolites.” Korean Journal of Environmental Agriculture 38, no.1 (2019): 61-67. doi: 10.5338/KJEA.2019.38.1.7. Many studies on artificial lighting have been recently performed to investigate its effect on agricultural products with good quality. This review was aimed at comparing the effects of artificial light on functional metabolites of the plants that were grown in greenhouses and growth chamber. It has been summarized that artificial lighting both in growth chambers and greenhouses caused different functional metabolites patterns depending on light quality. Even though the same light quality was applied, different patterns in metabolites were observed in different plant species. For the same species, supplementation of the same light quality in both growth chambers and greenhouses did cause different functional metabolites patterns. Artificial lighting caused different patterns in functional metabolites of plants grown in greenhouses and growth chambers, depending on the light quality and/or plant species. The manipulation of plant growth and functional metabolites would be possible by engineering the light qualities, but knowledge on proper lighting condition depending on plant species and growth places would be necessary. 최근 인공광원을 사용하여 작물 생산량과 품질을 개선하려는 연구가 늘어나고 있다. 시설재배에서는 빛이 부족한 계절에 광합성과 식물성장 저하 같은 문제들이 발생하는데 인공광원을 이용하여 보완할 수 있기 때문이다(Jiang et al., 2017). 광부족 등 환경 제약에 대한 대처방안으로, 식물공장을 이용한 작물의 대량생산 요구는 크게 증가하고 있어 인공광원의 작물에 대한 영향에 대한 연구가 활발하다(Ouzounis et al., 2015b). 현재까지의 연구결과들을 살펴보면, 인공광원을 이용할 때, 광질에 따라 작물 생산량 뿐 아니라 식물체 내 유용 물질이나 색소 합성이 조절된다는 연구결과가 보고되었다(Heo et al., 2010; Ouzounis et al., 2015b). 인공광원으로는 고압나트륨등(HPS lamp, High-pressure sodium lamp), 삼파장등(3-Wave lamp), 형광등(fluorescent light), 백열등(incandescent lamp), 메탈할라이드등(metal halide), LED (Light-Emiting Diode)와 같은 것들이 이용된다(Heo et al., 2010; Heo et al., 2015). 이들 중 LED는 다른 광원들에 비해, 광에 의한 온도증가가 적고, 수명이 길고, 크기가 작아, 광합성에 유용한 특정파장대의 빛을 공급할 수 있는 장점이 있다(Trouwborst et al., 2010). LED 조사 효과는 오이(Trouwborst et al., 2010), 토마토(Dzakovich et al., 2015), 밀(Goins et al., 1997), 벼(Jung et al., 2013), 호접란, 장미, 국화, 초롱꽃(Ouzounis et al., 2015a, 2014) 등 다양한 작물을 대상으로 연구되었다. 작물 종류와 품종에 따라 적합한 LED보광에는 차이가 있으며, LED보광의 디자인에 따라 기능성물질 생산을 달리할 수 있어, 작물별 LED의 효과적인 사용법에 대한 이해가 필요하다(Ouzounis et al., 2015b). 지금까지 수행된 연구들을 살펴보면, 1)밀폐형 식물생산 시스템에서 온전히 제어된 광 조건에서의 연구와 2)온실 및 비닐하우스와 같은 시설재배에 있어서 보광을 한 연구로 구분할 수 있다. 자연광을 사용하지 않는 밀폐형 식물생산 시스템에서 얻어지는 결과와 온실 및 비닐하우스와 같은 재배 시설에 보광을 하는 경우 작물에 미치는 영향이 다를 수 있다(Heo et al., 2010; Heo et al., 2015). 이는 광질에 따라 작물 내 생산되는 대사물질이 변할 수 있으며, 광질을 포함한 양수분조건 등의 환경요인에 의해 기능성물질 생산이 달라질 수 있기 때문이다(Li and Kubota, 2009; Lee et al., 2016; Lim et al., 2016a, 2016b). 본 리뷰에서는 밀폐형 식물생산 시스템과 시설재배에서 보광으로 사용된 광질이 식물체 내 기능성 물질에 어떠한 효과를 주었는지 비교, 정리를 통해 효과적인 인공광원 사용방법에 대해 고찰해 보고자 한다. 밀폐형 시스템에서 사용된 광원은 주로 형광등, 오스람램프, LED가 이용되었고 여러 작물에 대해 많은 연구가 수행되었다(Cybularz-Urban et al., 2007; Liu et al., 2018). 생장상 내에서 특정 작물 재배시, 다양한 광질처리가 기능성물질 생산에 어떤 영향을 주는지, 이를 바탕으로 최적 광질조건을 제시하려는 연구들이 이루어졌다. Samuoliené 등(2013)에 따르면 Baby leaf 상추에서 적청, 초적색광이 섞인 표준 LED 조사에 비해 표준 LED에 주황색 LED를 보광한 경우가 페놀화합물을 증가시켰고, 녹색 LED보광이 α-carotene과 안토시아닌을 증가시켰다. Gupta와 Karmakar(2017)은 Swertia chirata라는 약용작물을 백색형광등으로 키운것보다 LED(적색, 청색, 적청1:1, 적청1:3, 적청3:1)로 키운 것이 클로로필, 카로티노이드 함량이 높았고(적색LED, 청색LED에서 가장 높음), 폴리페놀도 높았다(청색LED에서 가장 높음). Liu 등(2018)은 Cyclocarya paliurus라는 약용나무를 백색 LED로 키운것보다 청색, 적색 또는 녹색 LED로 재배한 경우 엽중은 감소되었으나, 총 플라보노이드 함량은 증가하였고, 특히 kaempferol, isoquercitrin, quercetin의 경우 청색 LED처리에서 가장 높았다. Bantis 등(2018)은 석류나무 묘목을 백색형광등으로 키운것보다 LED(적청녹색, 적청색)에서 재배한 것이 클로로필과 카로티노이드 함량이 적었고, 적청색 LED에서 플라보노이드와 안토시아닌 함량이 높았다. Choi 등(2015)은 잎들깨를 오스람램프로 재배한 것 보다 청색 LED로 재배한 것이 Vitamin C 함량이 높았고 안토시아닌의 경우 적색 LED, 적청색 LED 순으로 높았으며, 청색 LED로 키운 경우에는 안토시아닌이 검출되지 않았다. 이러한 결과는 Vitamin C의 함량 측면에서는 청색광이 좋지만, 안토시아닌 함량 측면에서는 다른 광질이 좋음을 보였다. Stutte 등 (2009)은 청색이 포함된 LED에서 자란 상추가 Triphosphor형광등에서 키운 것보다 안토시아닌과 같은 방어물질을 증가시킨다고 하였다. 동일한 광질을 처리하였더라도 기능성 물질은 작물에 따라 다르게 반응하는 것으로 나타났다. Arena 등(2016)에 따르면 토마토와 버즘나무(Oriental plane)에서 적녹청(1:1:1) 또는 적청(1:1) LED 조사에 의해 토마토는 백색형광등 대비 β-phellandrene 감소, α-pinene, carene, α-terpinene의 증가를 보였으나, 버즘나무의 경우는 isoprene의 감소를 보였다. 식물은 광 파장에 따라 다른 광수용체를 지니고 있어, 식물체의 이차대사산물 중에는 광을 흡수하는 색소가 있으므로 (Ouzounis, 2015b) 광질 마다 특정 대사산물들에 영향을 줄 것으로 예상된다. 청색광은 상추, 브로콜리 등의 기능성물질을 증가시켰으나 서양난의 일종인 카틀레야의 경우는 변동이 없었다(Cybularz-Urban et al., 2007; Li and Kubota, 2009; Kopsell and Sams, 2013). Cybularz-Urban 등(2007)에 따르면 청색형광 등이 백색형광등에 비해 카틀레야의 건중을 증가시켰으나 클로로필, 카로티노이드 함량에는 변동이 없었다. Li와 Kubota (2009)에 따르면 백색형광등에 청색 LED를 보광한 것이 백색형광등에 비해 Baby leaf 상추의 안토시아닌, 카로티노이드, 페놀화합물을 증가시켰다. Kopsell과 Sams(2013)에 따르면, 적청색 LED(88%:12%)로 재배하다가, 수확 전 5일 동안 청색 LED를 처리한 브로콜리가, 계속 적청색 LED로 재배한 것보다 β-carotene, viola-xanthin, total xanthophyll cycle pigments, aliphatic glucosinolates, 미량원소, 다량원소를 증가시켰다. 다른 파장의 광원들의 경우를 살펴보면, 적색광의 경우 안토시아닌 등의 플라보노이드와 클로로필을 증가시켰다(Gupta and Karmakar, 2017; Liu et al., 2018; Choi et al., 2015). 주황색광은 페놀화합물을 증가시켰다(Samuoliené et al., 2013). 녹색광은 안토시아닌 등의 플라보노이드, 카로티노이드를 증가시켰다(Samuoliené et al., 2013; Liu et al., 2018). 적청색광은 안토시아닌, 클로로필, 카로티노이드 등을 증가시켰다(Gupta and Karmakar, 2017; Bantis et al., 2018; Choi et al., 2015). 조사된 자료만으로 파장대에 따른 차이는 보기 어려웠지만, 대조군으로 사용된 백색광에 비하여 특정 파장대의 광질들이 식물내 색소들에 영향을 주었음을 확인할 수 있었다. 시설재배에서는 주로 형광등, 삼파장등, 고압나트륨등, LED등이 최근 10년간의 연구에서 보광으로 사용되었다(Heo et al., 2010; Martineau et al., 2012; Nascimento et al., 2013; Kondo et al., 2014; Heo et al., 2015; Lee et al., 2016). 시설재배에서도 밀폐형시스템과 마찬가지로 특정 작물에 대해 기능성물질에 최적 광질조건을 선발하려는 연구들이 시도되었다. Kondo 등(2014)에 따르면 비닐하우스에서 포도를 키울 때 해뜨기 전 3시간, 해뜬 후 3시간동안 청색 LED 또는 적색 LED를 보광했을 때 보광하지 않은 경우에 비해 포도껍질의 안토시아닌과 당함량이 증가하였고, 청색 LED가 더 큰 효과를 보였다. Heo 등(2015)에 따르면, 온실재배에서 자연광에 삼파장등, 고압나트륨등, 1.2μmole m-2s-1의 적색 LED를 보광한 경우, 케일의 생체중이 증가하고, 0.6과 1.2 μmole m-2s-1 적색 LED는 당함량을 증가시켜 품질 개선효과를 보였다. 밀폐형시스템과 마찬가지로 시설재배의 경우에도, 동일한 광질처리를 하더라도 식물에 따라 다른 효과를 보였다(Heo et al., 2010; Ouzounis et al., 2014). Heo 등(2010)에 따르면 유리온실에서 적색 LED, 청색 LED, 적청색 LED를 보광하였을 때 디펜바키아의 당, 클로로필 양은 변동이 없었으나 카로티노이드 함량은 청색 LED에 의해 감소하는 결과를 보였고, 인도고무나무는 당, 클로로필, 카로티노이드 함량에 변동이 없었다. Ouzounis 등(2014)의 연구에서 장미, 국화, 초롱꽃에 백색 LED, 청색 40% + 적색 60% LED, 청색 20% + 적색 80% LED, 적색 100% LED의 보광처리 하였을 때, 건물중의 경우 장미는 백색광에서, 국화는 적색광에서 가장 적었고, 초롱꽃은 광질의 영향을 받지 않았다. 반면, 페놀화합물과 플라보노이드가 청색광 비율이 높아질수록 증가하는 결과를 보였다. 광 파장에 따른 영향을 살펴볼 때, 적색광은 안토시아닌과당 증가를 보였다(Kondo et al., 2014). 청색광은 안토시아닌과당 증가, 플라보노이드 함량과 항산화도를 증가(Nascimento et al., 2013; Kondo et al., 2014). 적청색광은 Martineau 등(2012)에 따르면 카로티노이드 함량에 영향을 미치지 않았다. 적청색광에 백색광이 섞인 경우, Lee 등(2016)에 따르면 형광등에 비해 당귀의 생장을 증가시켰으나, Decursin 및 Decursinol angelate 함량은 감소시켰다. 동일 작물에 동일 광질을 보광하더라도 시설재배지와 밀폐형 재배환경에서 재배하였을 때 다른 결과를 보였다(Li and Kubota, 2009; Samuoliené et al., 2013). Samuoliené 등(2013)에 따르면 Baby leaf 상추를 유리온실에서 재배하였을 때, 고압나트륨등에 청색 LED를 보광하면 고압나트륨등 조사에 비하여 α-tocopherol과 γ-tocopherol는 증가하나, ascorbic acid, α-carotene, β-carotene는 감소하는 경향을 보이는 등, 기능성 물질의 종류에 따라 서로 다른 반응을 보였다. 이러한 결과는 동일 작물에 대하여 밀폐형 생장상에서 청색 LED를 보광한 Li와 Kubota(2009)의 결과와는 차이를 나타낸다. Li와 Kubota(2009)의 실험에서 백색형광등에 청색 LED를 보광한 것이 백색형광등만 처리한 것에 비해 Baby leaf 상추의 안토시아닌, 카로티노이드, 페놀화합물을 증가시켰다. This work was carried out with the support of "Cooperative Research Program for Agriculture Science & Technology Development (Project No. PJ012523)" and the 2018 RDA Fellowship Program of Rural Development Administration, Republic of Korea. 1. Arena, C., Tsonev, T., Doneva, D., De Micco, V., Michelozzi, M., Brunetti, C., Centritto, M., Fineschi, S., Velikova, V., & Loreto,F. ((2016)). The effect of light quality on growth, photosynthesis, leaf anatomy and volatile isoprenoids of a monoterpene-emitting herbaceous species (Solanum lycopersicum L.) and an isoprene-emitting tree (Platanus orientalis L.).. Environmental and Experimental Botany 130. 122 - 132. 2. Bantis, F., Karamanoli, K., Ainalidou, A., Radoglou, K., & Constantinidou,H. I. A. ((2018)). Light emitting diodes (LEDs) affect morphological, physiological and phytochemical characteristics of pomegranate seedlings.. Scientia Horticulturae 234. 267 - 274. 3. Choi, J. H., Kang, E. S., Kim, J. S., & Eun,J. S. ((2015)). Effect of LED lighting on growth and functional material contents in perilla (Perilla frutesens L.).. Journal of Agriculture & Life Sciences 46. 9 - 15. 4. Cybularz-Urban, T., Hanus-Fajerska, E., & Swiderski,A. ((2007)). Effect of light wavelength on in vitro organogenesis of a Cattleya hybrid.. Acta Biologica Cracoviensia 49. 113 - 118. 5. Dzakovich, M. P., Gómez, C., & Mitchell,C. A. ((2015)). Tomatoes grown with light-emitting diodes or high-pressure sodium supplemental lights have similar fruit-quality attributes.. HortScience 50. 1498 - 1502. 6. Goins, G. D., Yorio, N. C., Sanwo, M. M., & Brown,C. S. ((1997)). Photomorphogenesis, photosynthesis, and seed yield of wheat plants grown under red light-emitting diodes (LEDs) with and without supplemental blue lighting.. Journal of Experimental Botany 48. 1407 - 1413. 7. Gupta, S. D., & Karmakar,A. ((2017)). Machine vision based evaluation of impact of light emitting diodes (LEDs) on shoot regeneration and the effect of spectral quality on phenolic content and antioxidant capacity in Swertia chirata.. Journal of Photochemistry and Photobiology B: Biology 174. 162 - 172. 8. Heo, J. W., Kim, H. H., Lee, K. J., Yoon, J. B., Lee, J. K., Huh, Y. S., & Lee,K. Y. ((2015)). Effect of supplementary radiation on growth of greenhouse-grown kales.. Korean Journal of Environmental Agriculture 34. 38 - 45. 9. Heo, J. W., Lee, Y. B., Kim, D. E., Chang, Y. S., & Chun,C. ((2010)). Effects of supplementary LED lighting on growth and biochemical parameters in Dieffenbachia amoena ‘Camella’and Ficus elastica ‘Melany.. Horticultural Science and Technology 28. 51 - 58. 10. Jiang, C., Johkan, M., Hohjo, M., Tsukagoshi, S., Ebihara, M., Nakaminami, A., & Maruo,T. ((2017)). Photosynthesis, plant growth, and fruit production of single-truss tomato improves with supplemental lighting provided from underneath or within the inner canopy.. Scientia Horticulturae 222. 221 - 229. 11. Jung, E. S., Lee, S., Lim, S. H., Ha, S. H., Liu, K. H., & Lee,C. H. ((2013)). Metabolite profiling of the short-term responses of rice leaves (Oryza sativa cv. Ilmi) cultivated under different LED lights and its correlations with antioxidant activities.. Plant Science 210. 61 - 69. 12. Kondo, S., Tomiyama, H., Rodyoung, A., Okawa, K., Ohara, H., Sugaya, S., Terahara, N., & Hirai,N. ((2014)). Abscisic acid metabolism and anthocyanin synthesis in grape skin are affected by light emitting diode (LED) irradiation at night.. Journal of Plant Physiology 171. 823 - 829. 13. Kopsell, D. A., & Sams,C. E. ((2013)). Increases in shoot tissue pigments, glucosinolates, and mineral elements in sprouting broccoli after exposure to short-duration blue light from light emitting diodes.. Journal of the American Society for Horticultural Science 138. 31 - 37. 14. Lee, G. I., Kim, H. J., Kim, S. J., Lee, J. W., & Park,J. S. ((2016)). Increased growth by LED and accumulation of functional materials by fluorescence lamps in a hydroponics culture system for Angelica gigas.. Protected Horticulture and Plant Factory 25. 42 - 48. 15. Li, Q., & Kubota,C. ((2009)). Effects of supplemental light quality on growth and phytochemicals of baby leaf lettuce.. Environmental and Experimental Botany 67. 59 - 64. 16. Lim, J. E., Cho, M. J., Yun, H. J., Ha, S. K., Lee, D. B., & Sung,J. K. ((2016a)). The Relation between Fertilization Practices and Functional Metabolites of Crops.. Korean Journal of Soil Science and Fertilizer 49. 168 - 180. 17. Lim, J. E., Lee, S. B., Lee, Y. J., Cho, M. J., Yun, H. J., Lee, D. B., Hong, S. Y., & Sung,J. K. ((2016b)). Effects of Water Deficit and UV-B Radiation on Accumulation of Functional Metabolites in Crops.. Korean Journal of Soil Science and Fertilizer 49. 409 - 419. 18. Liu, Y., Fang, S., Yang, W., Shang, X., & Fu,X. ((2018)). Light quality affects flavonoid production and related gene expression in Cyclocarya paliurus.. Journal of Photochemistry and Photobiology B: Biology 179. 66 - 73. 19. Martineau, V., Lefsrud, M., Naznin, M. T., & Kopsell,D. A. ((2012)). Comparison of light-emitting diode and high-pressure sodium light treatments for hydroponics growth of Boston lettuce.. HortScience 47. 477 - 482. 20. Nascimento, L. B., Leal‐Costa, M. V., Coutinho, M. A., Moreira, N. D. S., Lage, C. L., Barbi, N. D. S., Costa, S. S., & Tavares,E. S. ((2013)). Increased antioxidant activity and changes in phenolic profile of Kalanchoe pinnata (Lamarck) Persoon (Crassulaceae) specimens grown under supplemental blue light.. Photochemistry and Photobiology 89. 391 - 399. 21. Ouzounis, T., Fretté, X., Ottosen, C. O., & Rosenqvist,E. ((2015a)). Spectral effects of LEDs on chlorophyll fluorescence and pigmentation in Phalaenopsis ‘Vivien’and ‘Purple Star’.. Physiologia Plantarum 154. 314 - 327. 22. Ouzounis, T., Fretté, X., Rosenqvist, E., & Ottosen,C. O. ((2014)). Spectral effects of supplementary lighting on the secondary metabolites in roses, chrysanthemums, and campanulas.. Journal of Plant Physiology 171. 1491 - 1499. 23. Ouzounis, T., Rosenqvist, E., & Ottosen,C. O. ((2015b)). 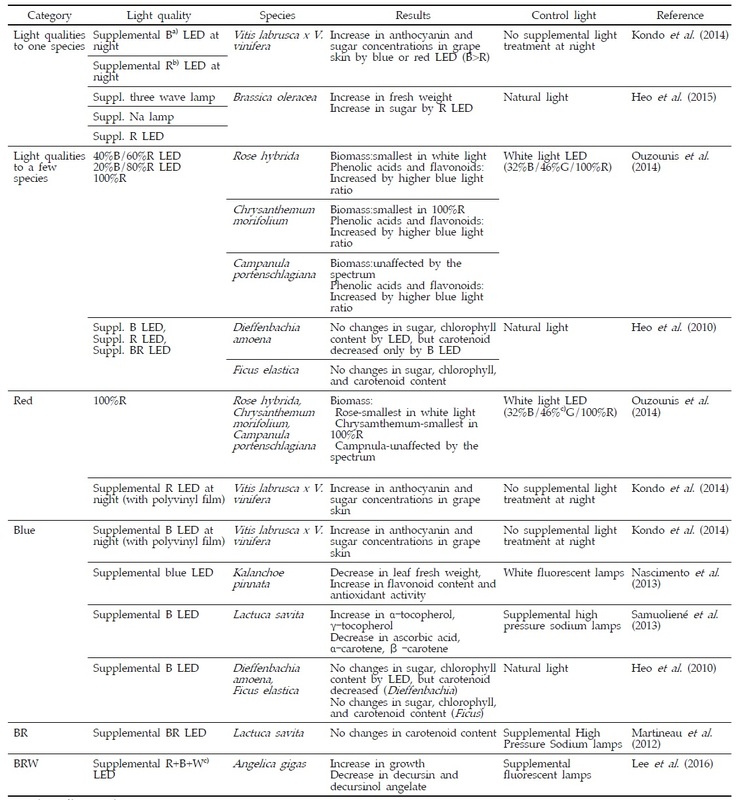 Spectral effects of artificial light on plant physiology and secondary metabolism: a review.. HortScience 50. 1128 - 1135. 24. Samuolienė, G., Brazaitytė, A., Sirtautas, R., Viršilė, A., Sakalauskaitė, J., Sakalauskienė, S., & Duchovskis,P. ((2013)). LED illumination affects bioactive compounds in romaine baby leaf lettuce.. Journal of the Science of Food and Agriculture 93. 3286 - 3291. 25. Stutte, G. W., Edney, S., & Skerritt,T. ((2009)). Photoregulation of bioprotectant content of red leaf lettuce with light-emitting diodes.. HortScience 44. 79 - 82. 26. Trouwborst, G., Oosterkamp, J., Hogewoning, S. W., Harbinson, J., & Van Ieperen,W. ((2010)). The responses of light interception, photosynthesis and fruit yield of cucumber to LED‐lighting within the canopy.. Physiologia Plantarum 138. 289 - 300.